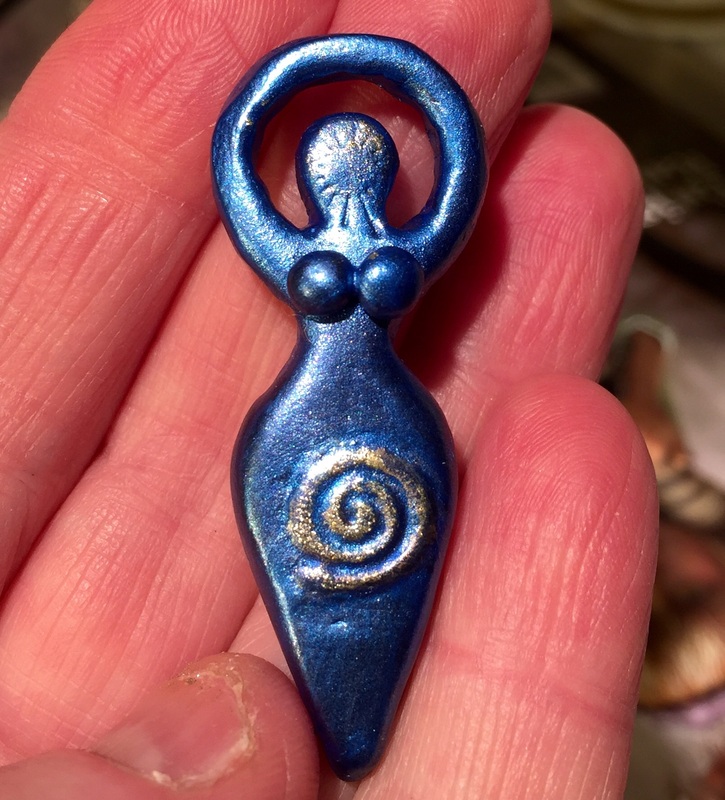 2″ tall Goddess beads by Karen A. Scofield. Artist grade polymer clay. Tutorial. Hi, I’m the artist, Karen A. Scofield and I live in Kenosha, WI. I made this tutorial after finding hundreds, if not thousands, of Pinterest pins showing my work. They linked to a blog that used my pictures and strongly inferred that one can made these with the kids out of a homemade cornstarch and baking soda clay. That’s an unauthorized use of my work and I find it misleading on several counts. My beads shown above are on my sari0009 flickr and appear in the blurb book Polymer Artists Showcase, by Tejae Floyde. (Tejae Floyde has a wonderful site and blog and has her work published in numerous magazines and books.) They’re about 2″ tall and I used artist grade polymer clay to make them (more on that in a moment). They’re colored with mica powders, then sealed. Note: This tutorial assumes that you have some basic knowledge of polymer clay but also includes information and links that can assist and inspire you. I do that for the people who may not know a lot about polymer clay but apply themselves to the task well enough anyway. Cheers to you! 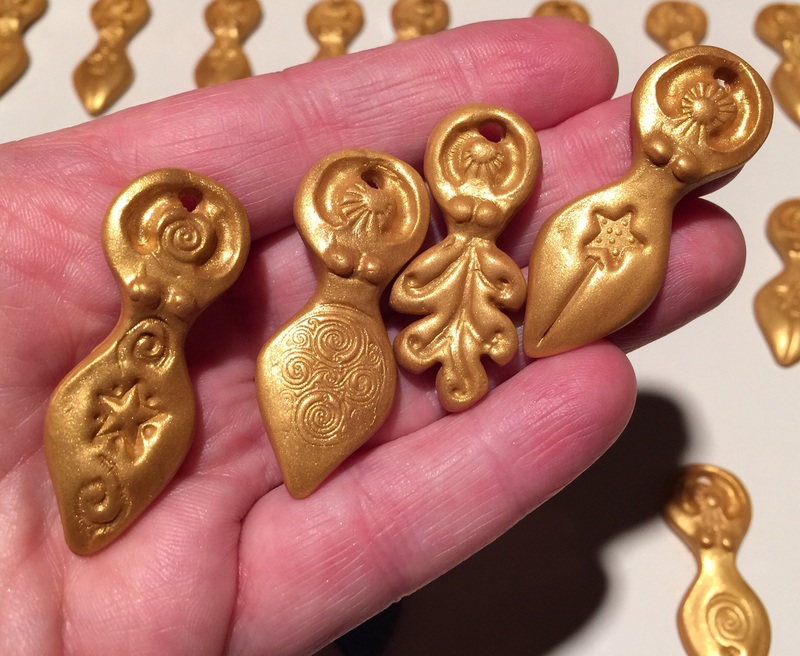 If you have enough of a background in polymer clay, you can probably follow along by mostly just reading the bolded font description of each step. Throughout the following tutorial, you can refer to the Glass Attic Online Polymer Clay Encyclopedia, if you have any further questions. It’s a most excellent and exhaustive resource. This is an intermediate to advanced project and is not suitable for children. I know I wouldn’t attempt it with children and maybe not even most older teens. It involves clay residue, an X-Acto Knife, knitting needles and/or clay tools, mica powders you don’t want to breathe in, wearing a mask, a higher level of attentiveness, and a lot of set up and clean up…not to mention baking your beads and sealing them. Note: Read the directions before proceeding! Clean off everything that you touch while handling the raw clay with baby wipes that have some rubbing alcohol in them. Time: Hands-on time is one to several hours. Actual time from start to finish will be several days to a week, depending on your dipping (into the finish) process. I’d say give it 2 to 6 days, minimum. 1. Decide on using molds or templates. Although making your own molds from the right materials has its many benefits, I chose to make and use templates out of printer paper because that’s what I did for the original picture, above. Choices to start with — use molds or cut out your own using templates. 2. Make your templates. Sketch out the shapes you want, perfect them, then cut them out of paper or template material. Or perhaps you size and print free templates from online somewhere. There are many historical Goddess figure types for your inspiration pleasure too. 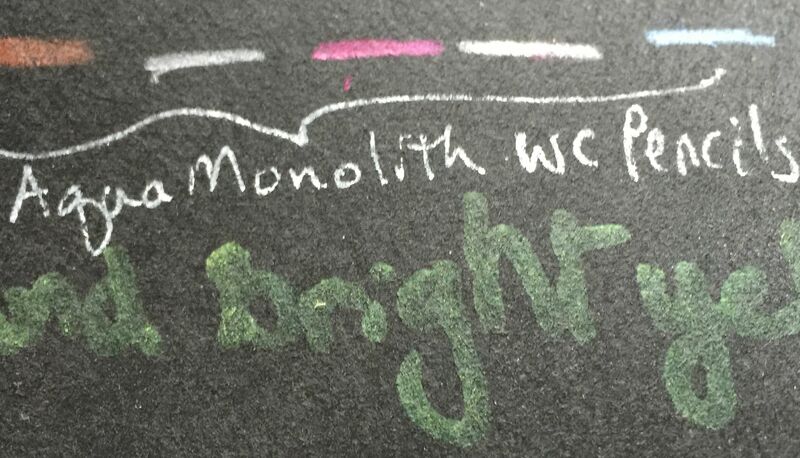 Make sure your final copies aren’t dirty with charcoal, graphite, and the like. I used a fine Sharpie marker to outline mine before cutting. Either way, the bead designs here were around 2″ long. I use small, curved craft scissors or cuticle scissors to cut out the templates. After you’ve made your templates, put them aside in a safe place for the moment. I put mine in a used, clean, dry, transparent prescription bottle. 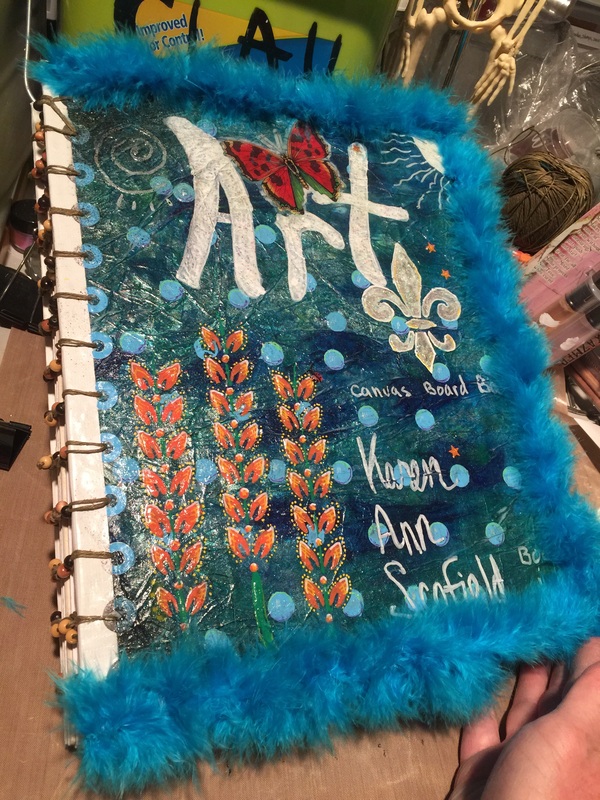 If you think you might like to reuse your templates for beads or other crafts, you could use a more durable template sheet – Dura Lar is an ideal material for making templates. 3. Choose your clay. If you choose to coat your beads with mica powder, which is quite beautiful, the powders show up best on black or dark clay, the darker the better! As for brands, artist grade clays suitable for these might be Premo, Pardo Jewellry Clay, Fimo Professional, or Fimo Classic. Today, I’m working with 8-ish-year-old Fimo Classic (from before its reformulation and associated temperature change). I keep my polymer clay’s in a controlled environment so the clay was relatively easy to condition despite its age. If you’re in the US, you can probably find Premo or Fimo Clasic in craft stores like Michaels or Jo-Ann Fabric and Craft Store. You’d probably have to order Pardo Jewellry Clay or Fimo Professional from an online source, in most areas. If you find it locally at this time, consider yourself lucky. If you have darker scrap clay, really dark, made from artist grade polymer clays like these, you might be able to use that. If you don’t want to work with mica powders, then you probably won’t have to seal your beads with Varathane later. You will not get the mica powder surface effects but you will have many polymer clay colors from which to choose. 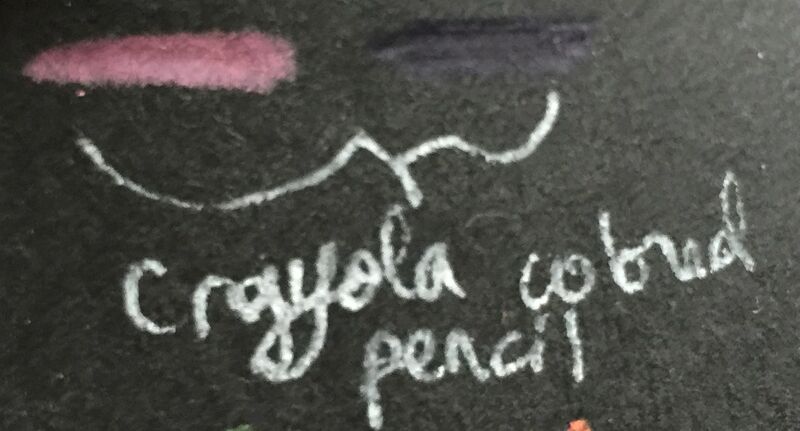 A Few Notes on Temperature and Polymer Clay — Polymer clays can partially cure if they get over 90 degrees F, so keep them in a cool, dark, dry place or buy them just before use. Never leave raw polymer clay in a hot vehicle or windowsill. Try to avoid ordering your polymer clays during the summer heat since heat can partially cure your clay or make it much harder to condition. Consider where your polymer clay is shipping from and what their weather is like. 4. Create a dedicated, clean work area. Now that you’ve chosen a clay, you’re going to make a clean and clear work area. I use a clay-friendly mat but you can also work on waxed paper. I’d suggest taping either down to a suitable surface that won’t get ruined by masking tape, etc. Why work over a polymer clay friendly mat, ceramic/marble tile, a clean sheet of glass, or waxed paper? You don’t want to get the raw clay residue on your furniture or rug, etc. The raw residue within uncured polymer clay has plasticizers in it, so it can chemically alter the finish on some furniture and other surfaces. Note: You could do the smoothing and assist design with a knitting needle and an embossing stylus tool but a few other favorite tools can come in handy. Small cutting mat (the one I use is only used for polymer clay work). If you don’t already have a magnifying lamp, you might consider getting one. 6. Wash your hands and mind what you wear. Wash your hands thoroughly, dry them, and make sure you’re not wearing clothes that shed fibers (a fluffy bathrobe or sweater, for example). Make sure you’re not working near the dryer (too much lint that will end up in your clay) or other things that may create dust or shed fibers/hair. Polymer clay is tacky by nature and can easily collect dirt and lint. It’s like a lint, dust, and fiber magnet. 7. Condition your polymer clay. Take out enough polymer clay to roll out and cut a few beads. A 2 oz. block or two might be more than enough, depending on how much you want to make. You’ll probably roll it out to about 5 mm or a quarter inch thick or so. You condition it by smushing it and rolling it in your hands until it’s pliable. 8. Roll out your polymer clay. You can roll it out to about 5 mm to about 1/4″ thick. If you make it too thick, it may be more difficult to cut without distortion. 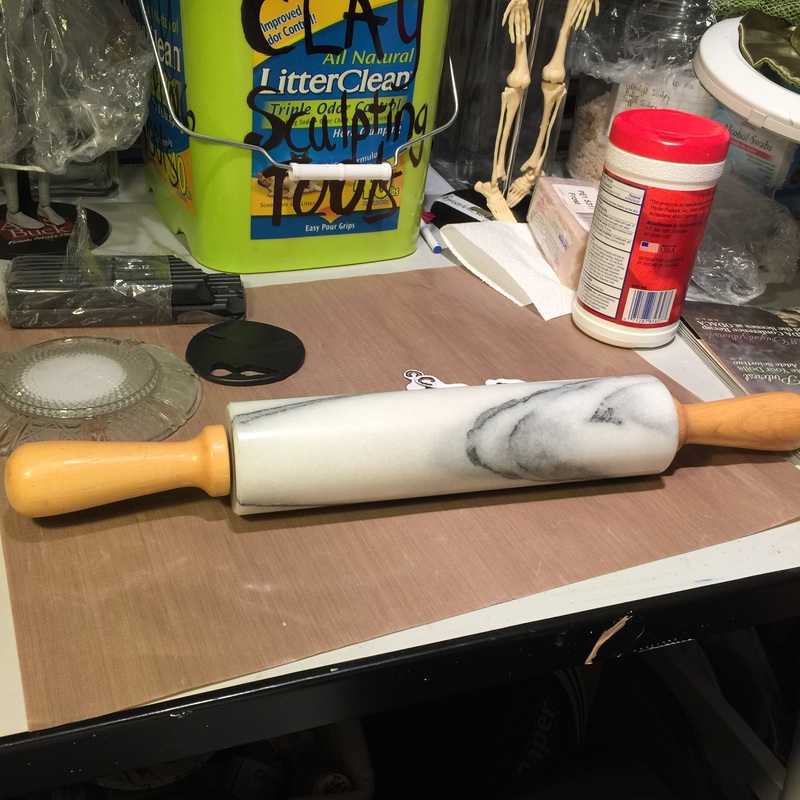 I use a heavy marble rolling pin for my polymer clay because it makes the job easier. You just have to take into account the weight as you try to roll it to a uniform width. As you roll, turn and flip the clay to create that uniformity. Don’t press down too hard and create too much distortion in any one area. Easy does it and have patience. 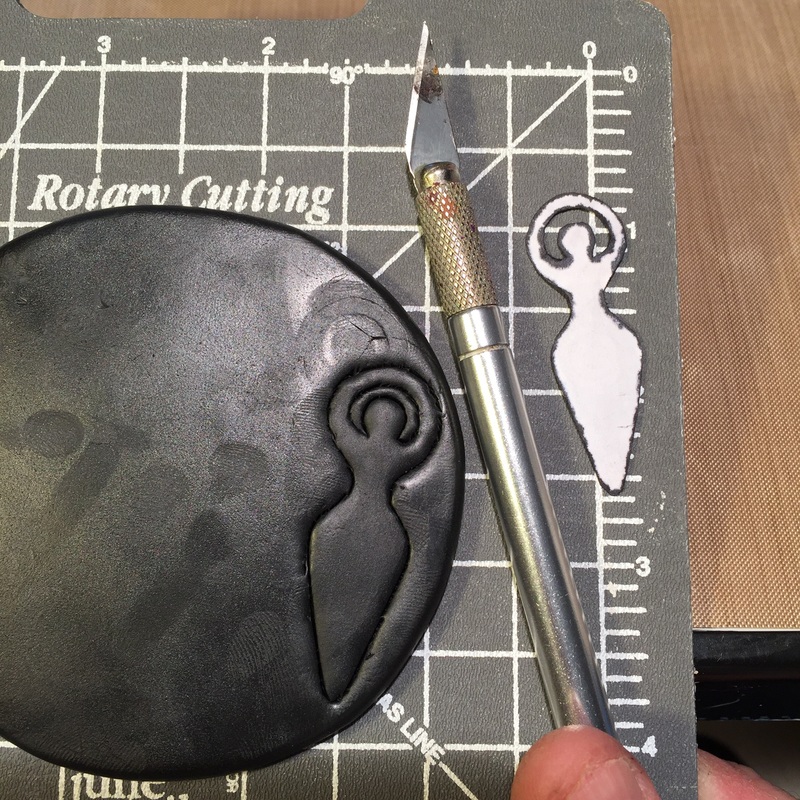 Cutting stage for polymer clay Goddess beads. 9. Lay out the template(s) and cut. You will not cut through at once. That creates too much distortion. Go around once with a more superficial, straight up and down, tentative cutting line, while making sure not to push in or cut the template. Go around several more times, again cutting straight up and down, as opposed to cutting sideways, at a slant. Cut the outer lines first, starting from the top of the figure to the bottom. Once the outer cutting is done, use the same careful cutting technique to make any inside cuts, like around the head and inside of the arms, for example. You may have to help the inside cuts along with curved cuticle scissors or fine, curved craft scissors. Just keep in mind not to rip, slice through, or distort the bead. This is not a job for the heavy-handed. 10. Smooth. Personally, I find it useful to work under a magnifying lamp at this point, much of the time. You will use your fingers and tools to round the cookie cutter type of edges you created. This part will take more hands-on time than your other steps, most likely. A lot more. Maintain a light-handed touch and hold the clay in such a way that you avoid too much distortion. (Even so, the connected “arms” in a design like this will lengthen slightly as you smooth, creating just a little more space around the head. This is why you don’t want a design that starts with much longer arms, unless that’s the look you really want.) You will bend your figure a bit as you work on it, so periodically take out the template and line it up again. Smooth the outer edges, kind of beveling (rounding) them. Smooth your inner surfaces and edges likewise. Keep checking your template against your work and adjust your figure accordingly. This is definitely not for the heavy-handed, those who have problems with mindfulness, or the impatient. 11. Stamp. You can create your own stamps using polymer clay and/or molding materials or use commercial ones. Commercial stamps have the same consideration — check to see if you can make derivative works if you plan to sell the beads you make with them. 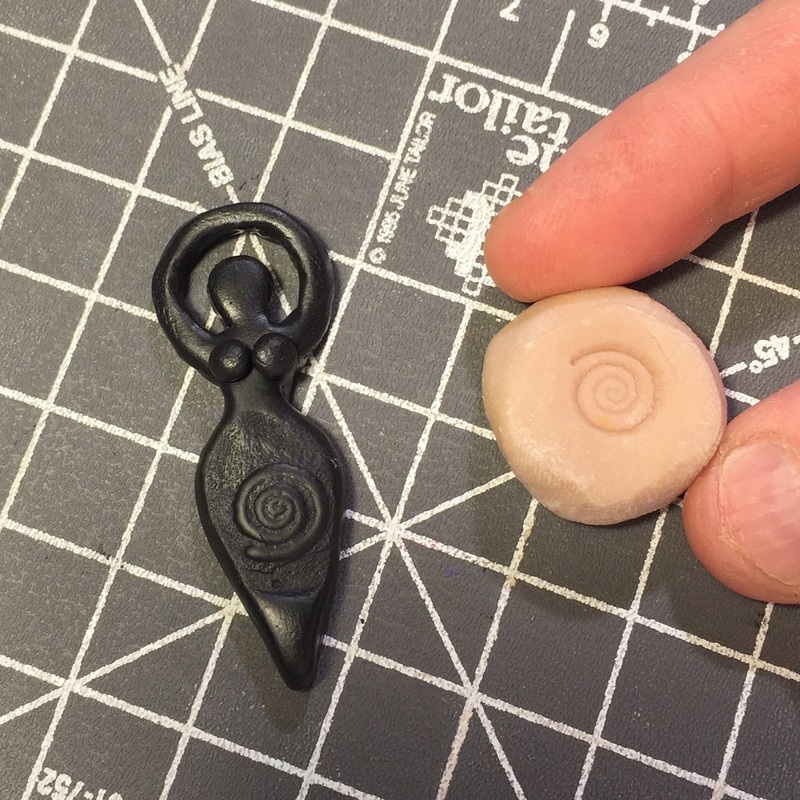 A popular pattern for Goddess bead design is the simple spiral. You can use molds that indent designs or that create raised ones. Expect to smooth out any unwanted ridges the edge of the stamp might create and touch things up. Search for “Polymer Clay Stamps” on Pinterest or check out Pinterest boards like this one: https://www.pinterest.com/donnadecicco/make-molds-clay-tools-texture-sheets/. Optional: Bead Holes. Chill your beads in the freezer for 15 minutes and gently use a sewing needle, pin, or bead hole wires made for polymer clay to create your bead holes. Run your bead hole tool into the hole from both directions while avoiding distortions that cannot be fixed. Create your bead holes before you apply mica powders and don’t clump the mica powder into the bead holes. 12. Add breasts if you want. Create two equal sized balls and lightly press onto the body of the bead without distorting them. You want to press hard enough that they stay attached though. These are sometimes best added after stamping but can often be added before you stamp on a design. Just be careful not to smush them when stamping on the design if you add a bosom first. 13. Mica powder (optional). Wear a face mask to avoid breathing in the mica powders. Personally, I find it best to work under a standing magnifying lamp at this point. You can apply mica powders to small designs with the head and side of the pointy top of a simple flat head sewing pin. Dip the pin lightly in the mica powder, perhaps lightly tap off the excess, and apply while avoiding dropping clumps of mica powder onto the clay. For coating the rest of the bead’s surface with Pearl Ex mica powder, use a small cosmetic brush, one small enough and soft enough for the task. Use the brush only for this type of task and keep it with your mica powders in a dust free container. 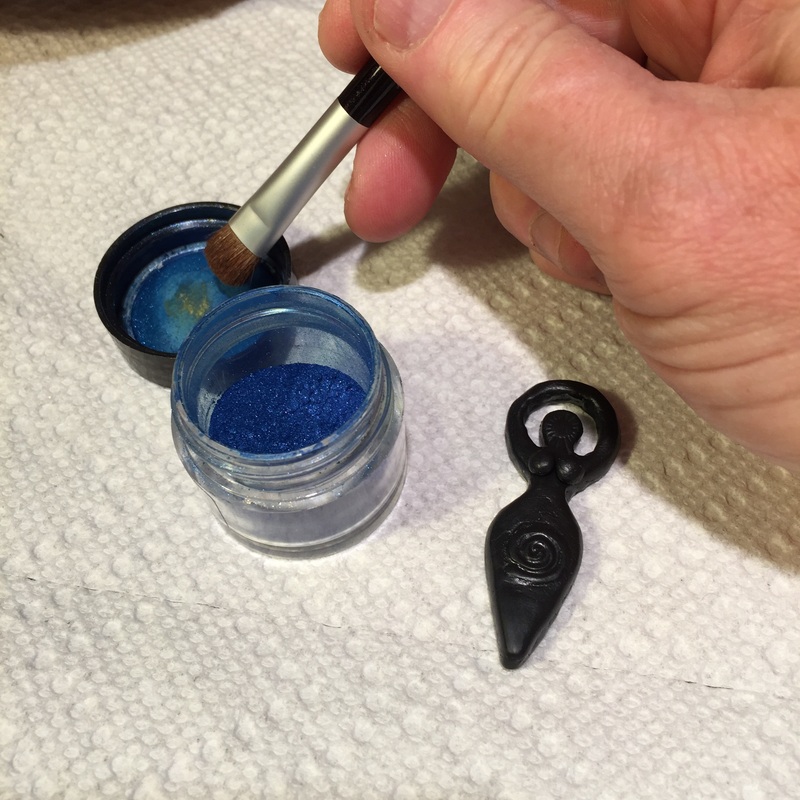 I often will get the mica powder off the inside of the lid and then apply it to the bead, perhaps occasionally adding a tiny bit to the lid in order to reload the brush. Lightly but thoroughly brush it on your bead. You will not want the brush so loaded with mica powder that it’s coming off all over the place as you apply it to the bead. You want to load it with just enough in order to gently apply it to the surface. You don’t want excess mica powder that’s loose on the surface of your bead. Easy does it. A little goes a long way. 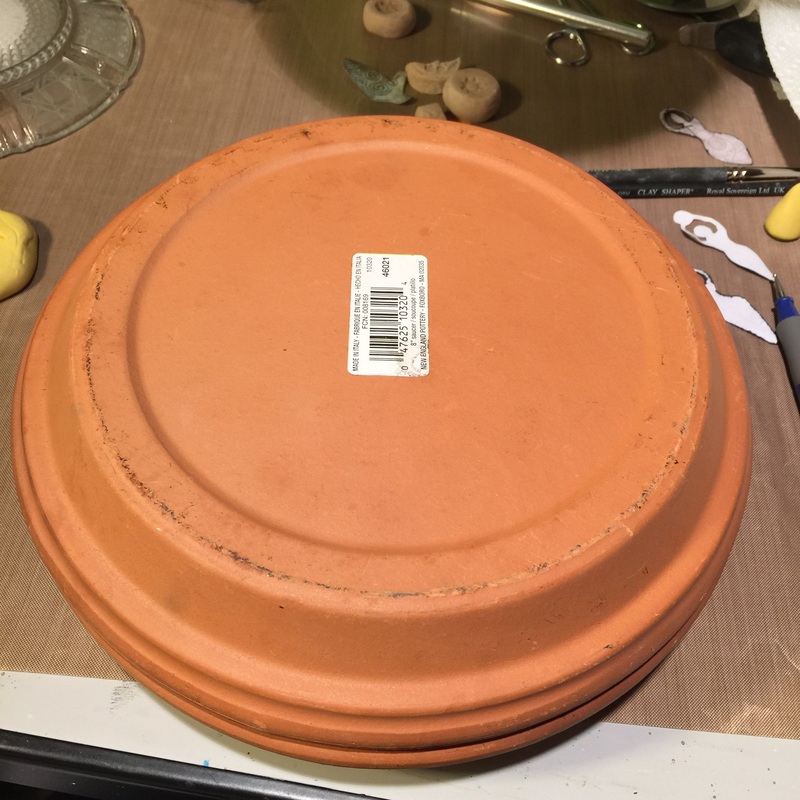 Two terra cotta saucers from the garden section are used to create a chamber for baking polymer clay beads. 14. Now that your bead is coated with the mica powders, place it on it’s final baking surface, wipe your hands with a wet wipe containing a bit of rubbing alcohol, and thoroughly wash your hands. Many people use a glossy ceramic tile inside disposable aluminum cooking pans with good results. (For this particular purpose, I used two terra cotta saucers of the same size and invert one over the other to create an enclosed baking container. It’s just one enclosed baking container possible). Check your bead alignment and arm placement against the template once again. Why make a point of cleaning your hands before leaving my work area and doing anything else? I make a point to mention cleaning one’s hands at this point out of personal experience — I hadn’t washed my hands, set the oven temperature, and later found that raw plasticizers left on my hands from handling uncured polymer clay had melted off the toaster oven dial numbers. Therefore, I clean my hands in this manner before leaving the studio or touching anything else. I’d hate to imagine what other dials and number and letter pads I could damage, or furniture finishes, etc. Add rubbing alcohol to your wipes — My baby wipes that I keep in the studio initially didn’t contain alcohol, most brands don’t these days, so I added some by simply dousing them lightly, the whole batch in their container, with rubbing alcohol. These wipes are then not used outside of the studio, but in the studio, they are great for cleaning my tools, my hands, and my work station. 16. Cool the bead before handling. This so you don’t burn yourself or mar the clay. Clays are often softer when hot out of the oven than they are after they’ve cooled. 17. Seal — Brush on thin layers, or dip, but don’t spray (probably optional if you didn’t use mica powders). Why seal? If you don’t seal a bead coated with mica powders, it will dull and the mica powders may wear of on your skin and clothes. Varathane is low odor, cleans up with soap and water and is pretty durable. To prepare, you will stir the Varathane slowly, let it settle for an hour or so with the lid on, then put some in a smaller container that has a good lid. Leave enough space because you’re going to thin it a bit with water. Stir slowly and carefully to avoid air bubbles. Apply the Varathane, let it dry a couple of days, apply again, let dry, apply again, let dry. It’s better to do several thin coats than one or two thick ones. Read the label for drying times. Avoid build up of the Varathane at the bottom of the bead but don’t scrape the bead while getting excess off. Some people scrape off the varathane without actually touching the bead and some spin the bead (without dropping it) to get the excess off. Refer to the dipping tutorial and other Varathane pages, below, if you have any questions. You may find it easier to brush it on rather an dip, just be careful to work on a mixed media sheet that wipes clean easily or a glossy, light colored or white, ceramic tile (you can wipe and/or scrape it clean with a razor blade). Varathane is chosen because it bonds best with the polymer clay and works best with the mica powders. It’ll be water-resistant but not waterproof. If your bead design doesn’t have bead holes, you can hang the bead by a thread and dip. The thread can be carefully cut away once the bead is completely dry — cut the thread flush with the bead’s surface without knicking the finish. You can hang your bead(s) to dry with the same thread. If you have bead hole, you can put a beading wire, thread or perhaps even a toothpick through and dip. I used a tie rack to hang my beads to dry because that’s what I had. Do You Have to Seal Polymer Clay? — http://thebluebottletree.com/seal-polymer-clay/ — this site talks about the range of sealers, what to avoid, what’s possibly suitable. Finished! — It’s not the best picture as it was taken at night. I usually photograph my beads in direct daylight on sunny days when it’s not too early or too late (yet almost never between mid morning and early afternoon). 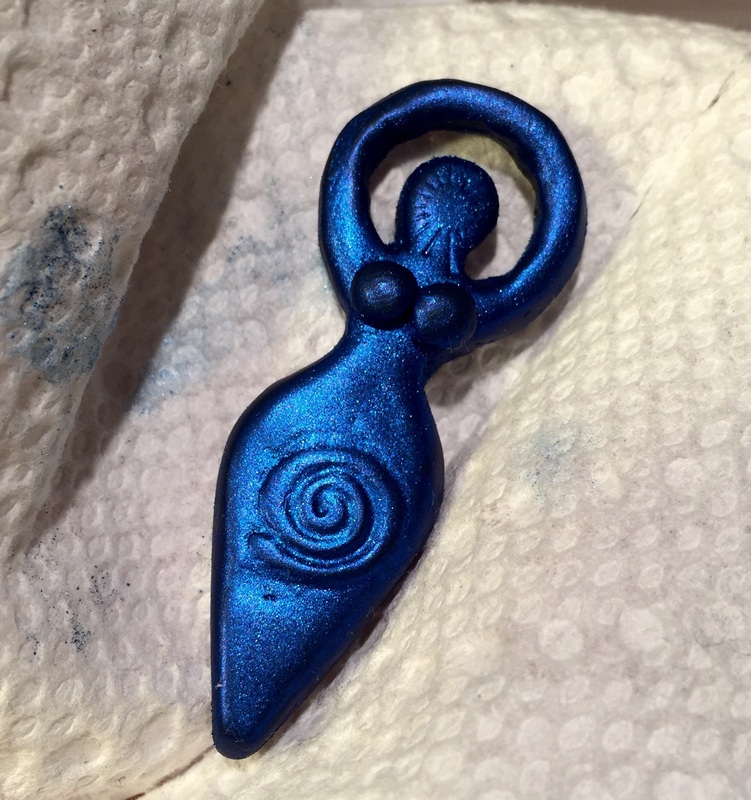 I was going to keep the bead all blue, but I decided to color the raised stamped areas with Viva Decor Precious Metal Color after the bead was baked . That’s another alternative. 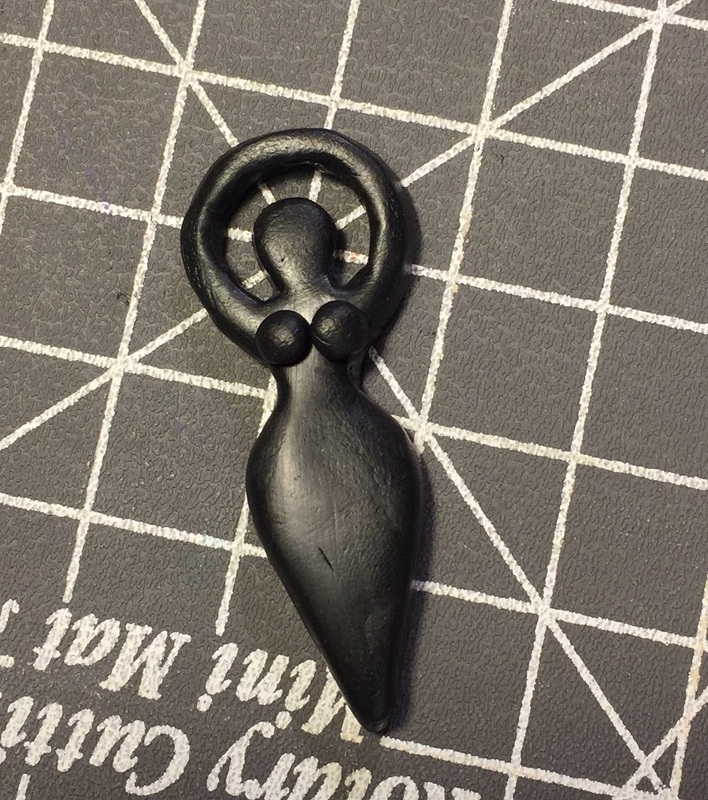 Today, I created a bead that I will attach to a necklace using a jewelry bail. That’s why this one didn’t need bead holes. If your bead and jewelry design called for bead holes, then you have to decide which direction the bead hole(s) will run. 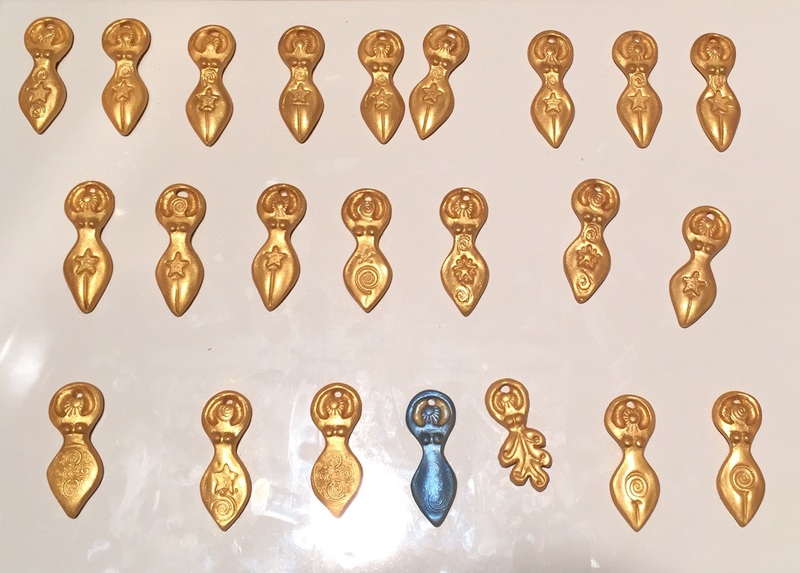 From designing and then conditioning clay to the last dip in the sealant, each bead can take from about 1 to 2 or more hours of hands-on time to create. You’ll be working with sharp instruments, powders you don’t want to breathe in, the oven, and Varathane. The constant mindfulness present while successfully creating something like this while avoiding rips and distortions is probably a good example of why artists and other creatives tend to have more gray matter. For all the above reasons, I’d say this is a tutorial for adults and perhaps some more mature teens that have very good hand-eye coordination. 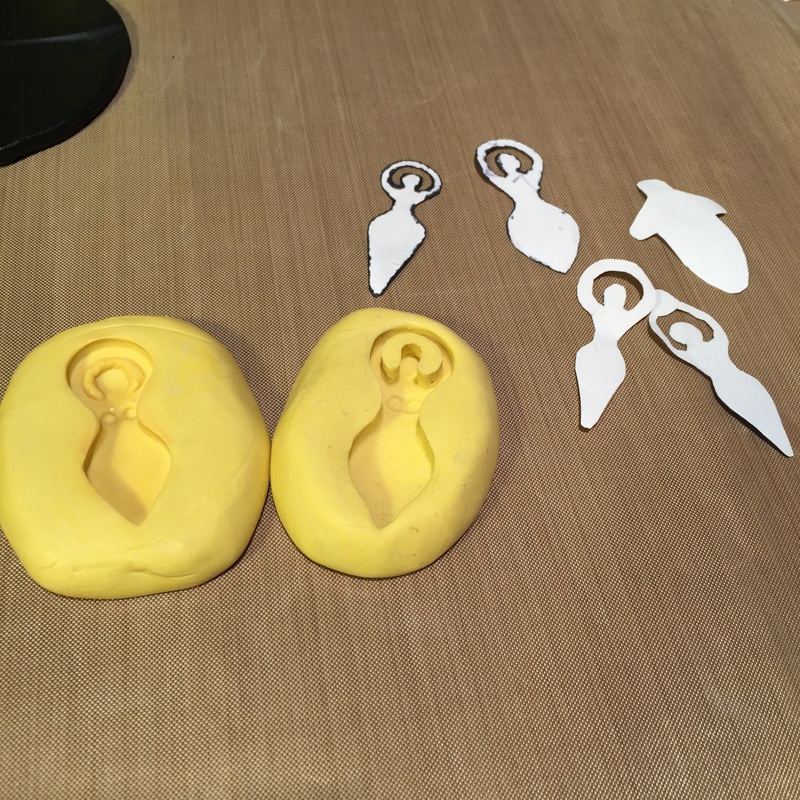 This time I used molds I made based on prototypes I made using the above method. They were coated with Aztec Gold Pearl Ex mica powder, except for one blue bead. I will yet add colored resin with glitter/mica inclusion and other touches, including finally sealing them in water based Varathane Interior, gloss. In the stars, such as in the bead on the right, below, I could use different chakra colors — or whatever else strikes my fancy. 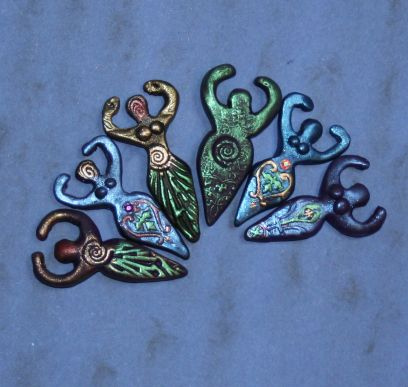 2″ Tall Polymer Clay Goddess Beads, by Karen A. Scofield. Many art doll artists build up and sculpt their polymer clay doll parts over wooden dowels. My recent youtube video shows that I can place these dowels in my stand and tilt the whole thing so that the art doll heads or other parts tilt up toward me as I work. I can just as easily return the stand to level position. The clay stand can go from work table to oven and has so far prevented burning of polymer clay parts during tests. It also evens out the temperature. Even good ovens momentarily spike in temperature, from what I understand, so it’s wonderful if you can find something that holds temperatures even within it, despite expected oven fluctuations. I made my stand out of clay using what I had, which was Amaco Air Dry Modeling Clay, but the one shown in the Creager Studios instructional DVDs was made out if wood. Since I made this with a natural air dry clay, and not a more durable kiln-cured clay, I coated it with Kato Liquid Polyclay and cured it. If I hadn’t done that, the stand could leave clay dust and crumbles all over while manipulating it. Problem solved. The Kato Liquid Polyclay was chosen because it cures at a higher temperature than the polymer clays I chose for creating my art dolls. This means I don’t have to worry about the Kato Liquid Polyclay burning. I guess I’m the oddball that makes a stand like this before really getting into sculpting polymer clay art dolls, I’m still a beginner, but I like figuring things out ahead of time in order to hopefully avoid some of the most common problems — how to comfortably work with your clay yet keep it as clean as possible, how to avoid marring it when working on it or between sculpting sessions, and how to cure it properly without burning or darkening the clay. Yeah. Note: This page will show more as my work progresses. The above shows my progress during the first two days. I have to add the lips, eyes, flesh it out more, shape it more, add details and then bake it. Where to buy the Creager Workshop DVDs: http://www.creagers.com/. I have all three and they’re really helping me. I love them. Rusty and a Beginner — I was a beginner when I started sculpting art dolls in 2005 but managed to get juried into an art gallery with assemblage type dolls. I’m diving in again after a years-long hiatus and this time, I want to do far more pure sculpting. I tried one head to toe body pure sculpt and then stopped. It’s been years since. I have hours and hours of practice ahead of me — I both look forward to it and dread the awkward stage. This time I hope to stick with it. So … I cracked open my Creager DVD on sculpting heads and this time I’m going to keep on trying. Right away, I came across numerous technical problems. Clay — Ooops. 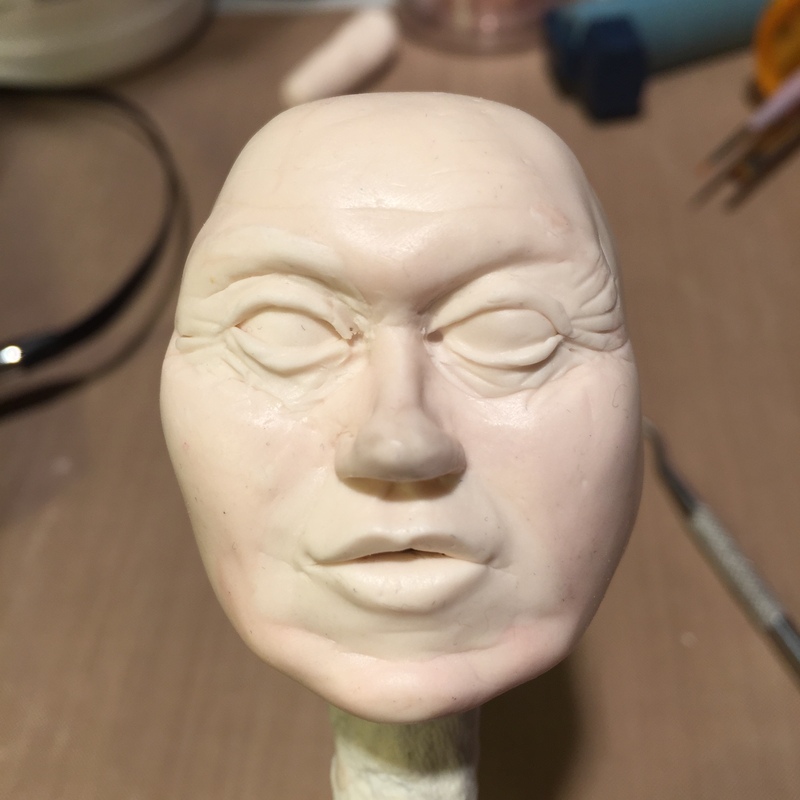 I chose a clay blend because I was in love with it after some pretty decent results in one of the softest clay — Sculpey UltraLIght. Like straight Sculpey Ultralight, however, my Super Sculpey-Sculpey Ultralight clay mix doesn’t blend or smooth well. 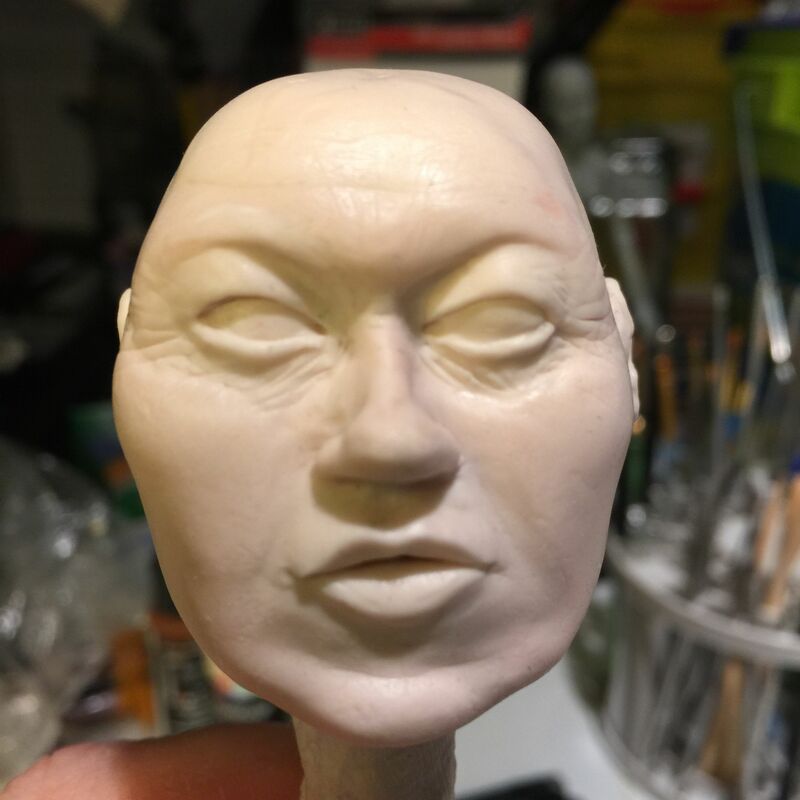 After this practice head, I’ll switch to working with more traditional art doll clays. They have varying degrees of softness and firmness but will blend and smooth well. Unfortunate Combination of Store Practices and Super Sculpey Packaging — Super Sculpey boxes aren’t sealed in a protective wrap, the boxes don’t close tightly, people often pinch off a piece or mar the clay, and stores invariably place Super Sculpey on bottom shelves where they’ll be exposed to the most dirt, dust, and lint. It’s not one of the more popular clays among hobbyists, so boxes often sit on the shelves longer than other clays, thus compounding the problem. Consequently the clay is often dirty before you even get it home and you can’t simply wash off the lint. I could shave off the sides and put them in a scrap clay container, I suppose. 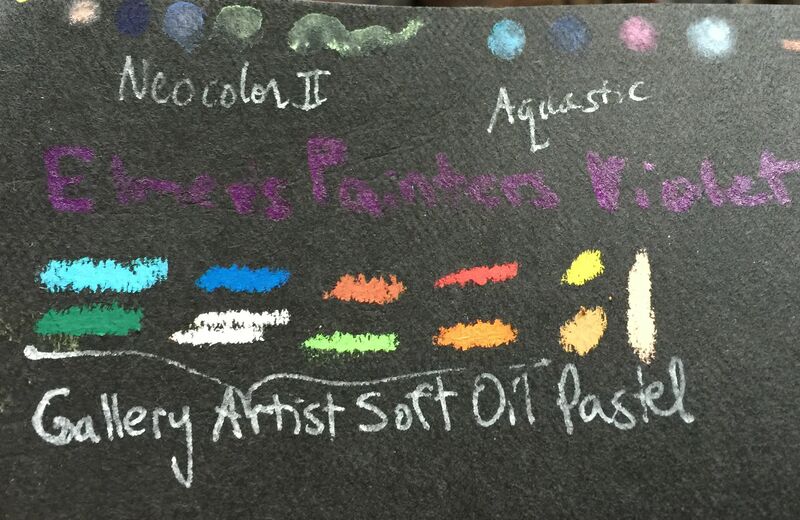 Brushes That Stain Clay — Jodi Creager said to use artist brushes…any small enough to smooth the clay. Not her fault, Murphy’s Law and all, but Daler Rowney Simply Brown Nylon Brushes leave their bristle color on my clay. Only the brown ones do that so far. I’ll look for other brushes, white and/or natural bristle ones. I guess I should test even brushes on polymer clay first. Test, test, test. Lots of testing with everything. Lint — I’m wearing light colored cotton with a white lab coat over it. No dark fibrous sweaters or towels are allowed in the studio. Pets are not allowed either. I cleaned my station for two days with wet wipes and even rubbed my claying mat with a wad of clay to pick up the lint and I’m still finding dark fibers of several different colors in the once clean clay after working it yesterday and today. Argh! I’ve been making progress every day or other day, the latest involving fine-tuned shaping and texturing, but as soon as I added rudimentary ears and and started to correct the jaw, I saw a bunch of things I want to change. 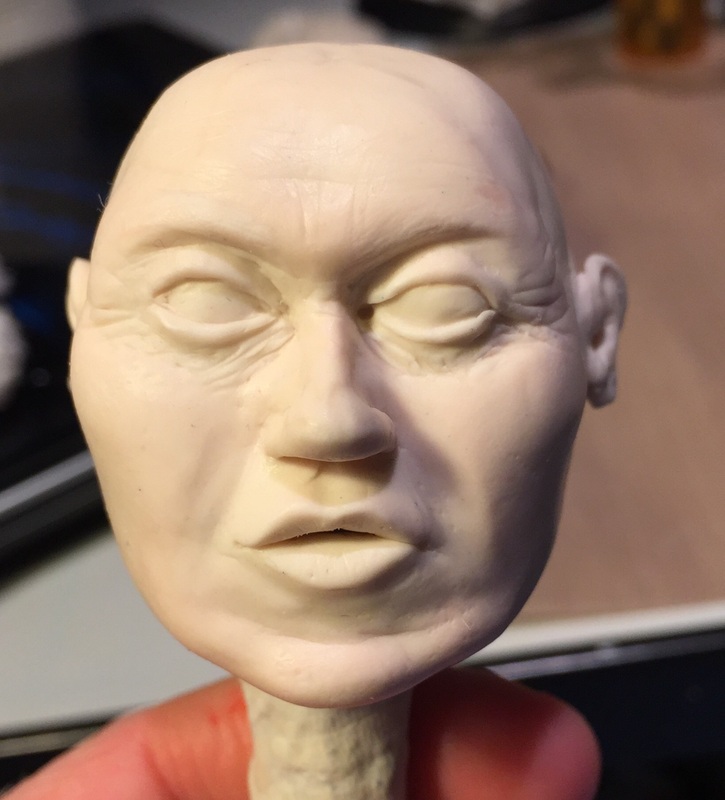 I need to add more to the top of the head, add more flesh to outer upper eyelid to reflect age, redo and lower ears, redo chin, add a bit to the upper lip right under the nose thus changing the bottom of the nostrils and nares slightly. For starters. Then I have to do the neck and continue with the rest of the body. I’ll probably have to do more texturing and even further fine-tuned shaping. Here’s a video that shows him from different angles at this stage, just in case WIPs (Works in Progress) interest you. For me, they’re a good record that I can organize into one ongoing post. 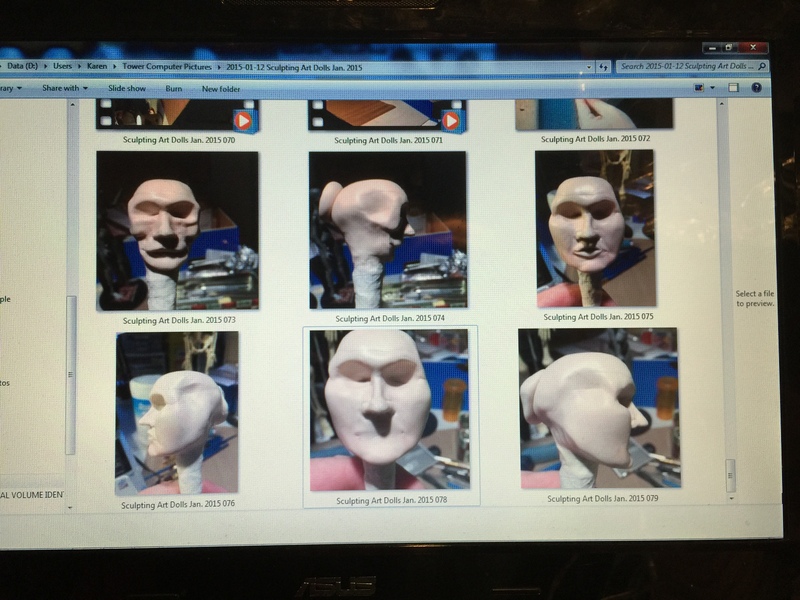 Learning how to sculpt with more of an additive process with Creager Studio Worshops “Sculpting the Head” Volume 1. Progress Jan. 26, 2015. I have to revisit the entire list of everything I’m working on because I didn’t make nearly the progress I wanted. Perhaps it’s better to make slow, small changes than to make such mistake that I don’t know how to save the work from that point. I have the urge to pure sculpt again. Pinterest Board: Art Dolls and Spirit Dolls. It includes definitions and some of the finer figurative art doll examples, photos of the artists, some videos, and the occasional tutorial. Enjoy. I finally separated finished art dolls from all the rest that might go into making them. It’s not all the usual, so you may want to check these boards out.